Waiting at the gate at Anchorage Airport, my phone beeps to life. I had spent the last two weeks in Alaska, without phone or internet coverage, and was looking forward to having a little time off back in Vancouver before the end of the summer. My phone disagrees. A few short days later, I’m sitting behind the wheel of a pick up truck on the road to Golden, and Nordic glacier (see Notes from Nordic). 740km of driving solo in one afternoon was certainly a first for me. This isn’t surprising when you consider that I come from a country that can be crossed three and a half times in that distance. It is quite a road though; the landscape constantly evolving between mountains, forests, and arid plains. Back at the airport, I had received a backlog of emails advising me that a research team from the University of Northern British Columbia (UNBC) were planning to travel to Nordic earlier than expected. Before leaving for Alaska, the plan had been to return to the glacier in mid September in order to dismantle and collect my equipment. Now, if I wanted to get back to my station this season, I needed to be on the helicopter flight tomorrow morning. I made it into Golden after dark, with the silent flashes of distant thunderstorms hinting at what the weather would have in store for us. Once again, I was being hosted by Tannis and Steve (of Sorcerer Lodge), and was grateful for a place to sleep that night. A short drive to the helicopter early the next morning, and we were on our way back into the mountains. We were a group of five; Rob Vogt and Ben Pelto from UNBC, Bob Sawyer, Steve, and myself. Click on images to enlarge. Due to a technical issue, the images in the first half of this article (from Nordic) were not taken with my usual camera, and are of a lower quality. 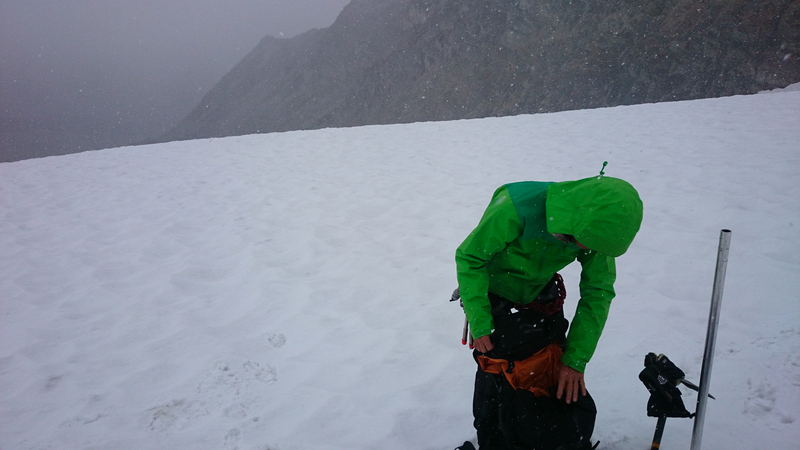 Autumn had arrived in the mountains, and we experienced some significant snow showers. The last I had seen of my station had been in early July as we were flying out after installing the equipment. Thoughts of failed power systems, wiring mistakes, and crevasses opening underneath had been frequently on my mind in the intervening period. 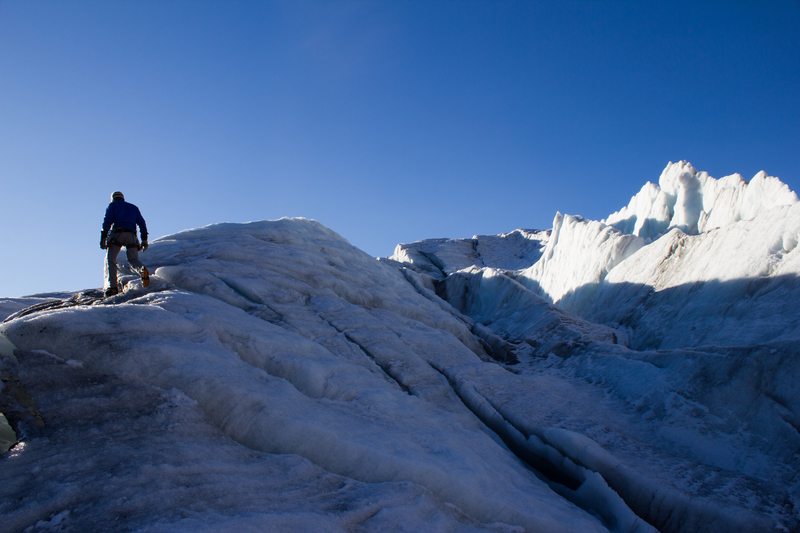 They were certainly on my mind that morning as Steve and I hiked up to the glacier. Ascending a ridge of ice, I could see emerging above me the rotating propeller of the wind sensor on the top of the station. So, it was still standing at least. As we approached closer, I could hear the low hum of one of the sensors, meaning power was still being supplied. So far so good. A quick check of the data logger (device for storing the measurements from the sensors) showed no obvious gaps in the data. More serious investigation would be left for the lab back in Vancouver, but I was delighted with that much. When designing each aspect of the station (see The Project), the fact that the glacier surface would be constantly melting and changing was always kept in mind. Seeing the change in reality, however, after such a short period of time was still a shock. 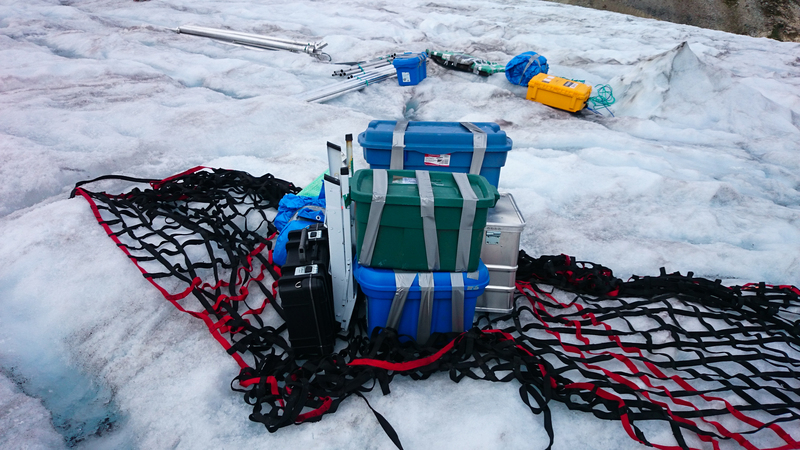 Equipment that I had installed while crouched on my knees was now towering above me, stranded high on 4 meter poles that had been fully submerged in the ice 48 days previously. An example of the changes observed on the surface. The above image shows the camera mount on the day it was installed (July 11th). The mounting poles were drilled 4 meters into the ice. 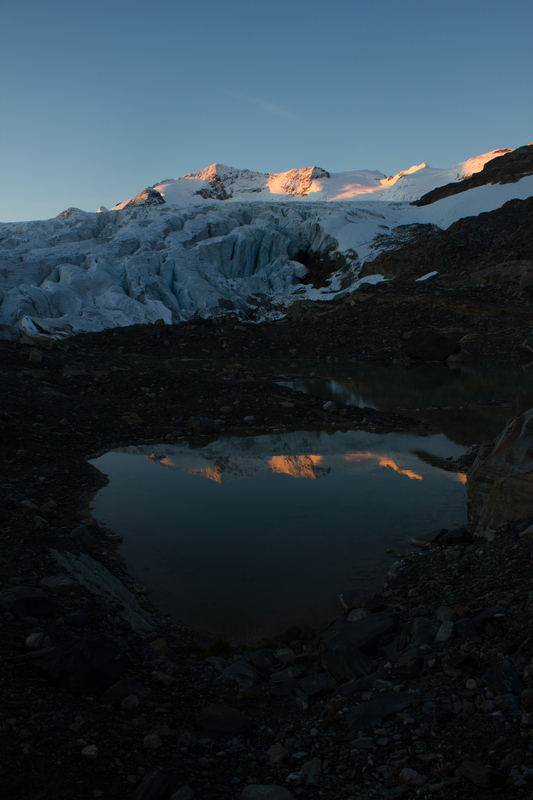 The image below shows the camera mount on returning to the glacier on August 28th. (This image is taken from a different angle and from further away). It took a day and a half to dismantle the station, and to pack everything up for transport out by helicopter. It would have taken significantly longer without Steve’s assistance throughout. With the last minute nature of this trip, I had thought that I would be tackling the station on my own, and I would probably be still up there trying to extract frozen pipes had that been the case. Preparing the sling load for transporting the equipment out by helicopter. I had been really curious (and nervous) to see how the camera had performed over the summer (see A Camera for all Seasons). For one reason, it would be a really useful source of information when it came to examining the data. Also, as I had built it, I would have no one to blame but myself if it hadn’t worked. Opening the case back in the lodge that night, the camera passed the first test; it switched on. Quickly checking through the pictures, the most recent image had been taken just a few minutes earlier as I was taking off my boots. Overall, the camera performed well, with just one day where it failed to shoot (looking into that). I’ve stitched the images together into the short timelapse video below, to give an idea of the changes taking place. 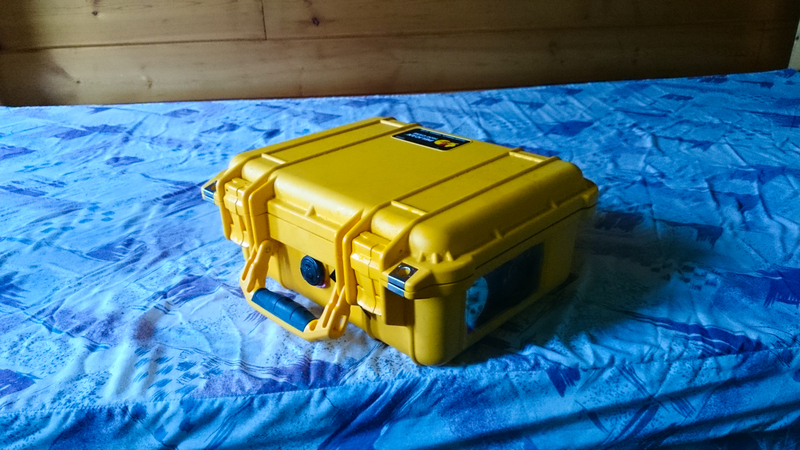 The camera box, just prior to me opening it to see if it had worked. 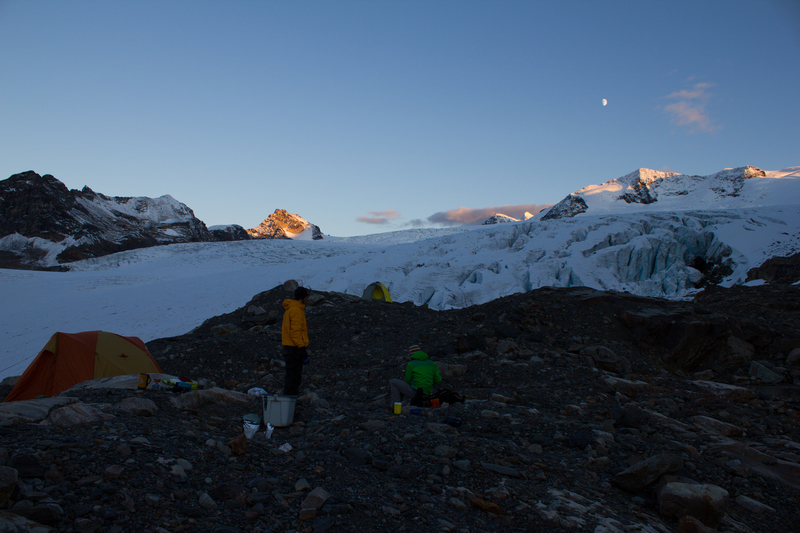 On the third day, I joined Rob, Bob, and Ben (seriously), and assisted with their work on the glacier. 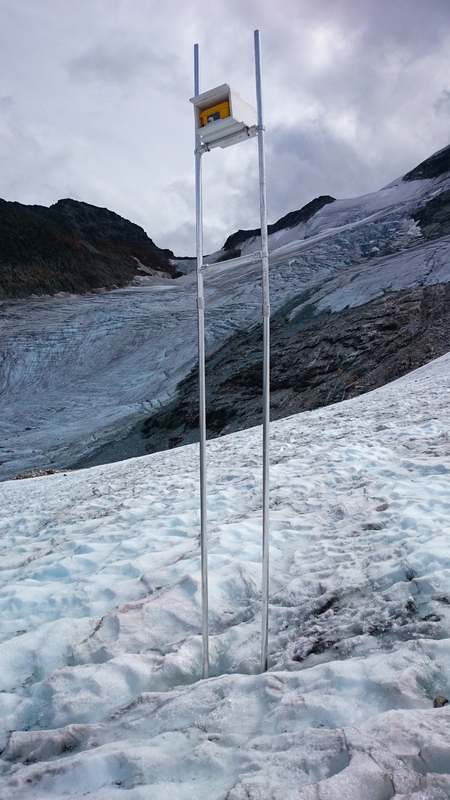 In order to monitor the loss or gain of ice over the glacier surface (known as it’s mass balance), a common method is to drill a series of stakes along the central line of the glacier (usually every 100 meters of elevation). 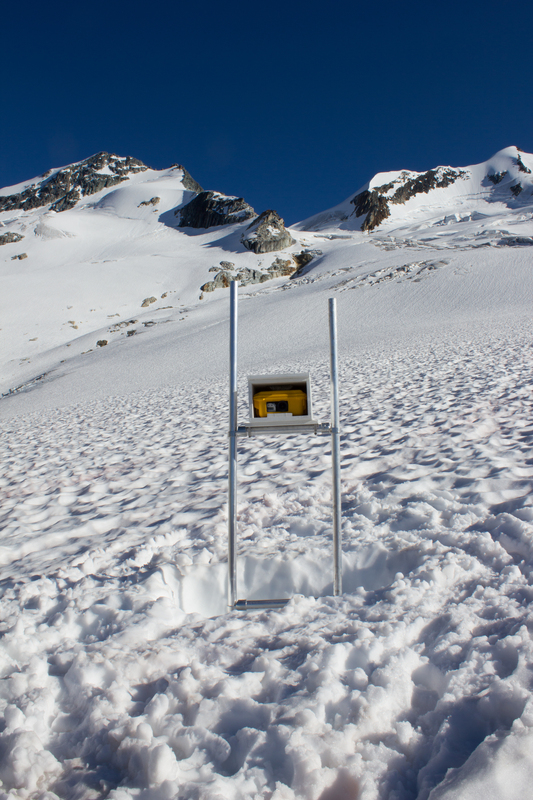 These ‘ablation’ stakes are inserted deep into the snow or ice, with just their tops emerging. 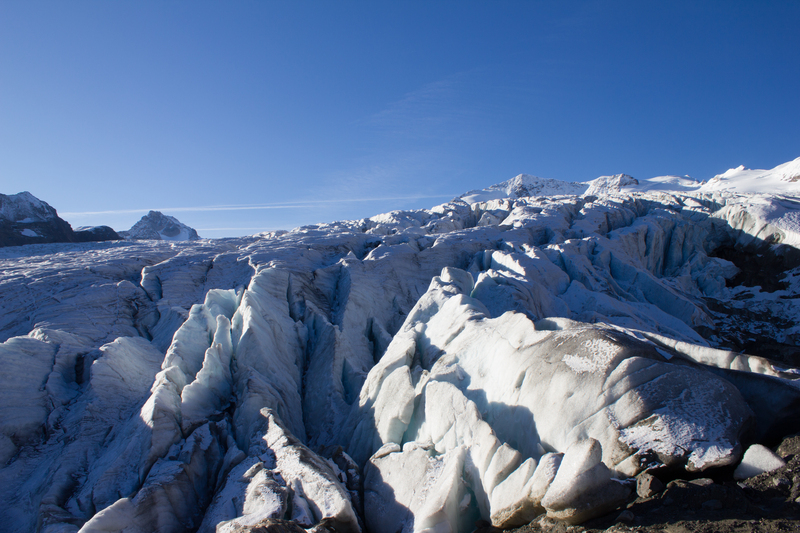 The stakes are visited at the same time the following year, and the change in the level of the glacier surface relative to the stake is measured. 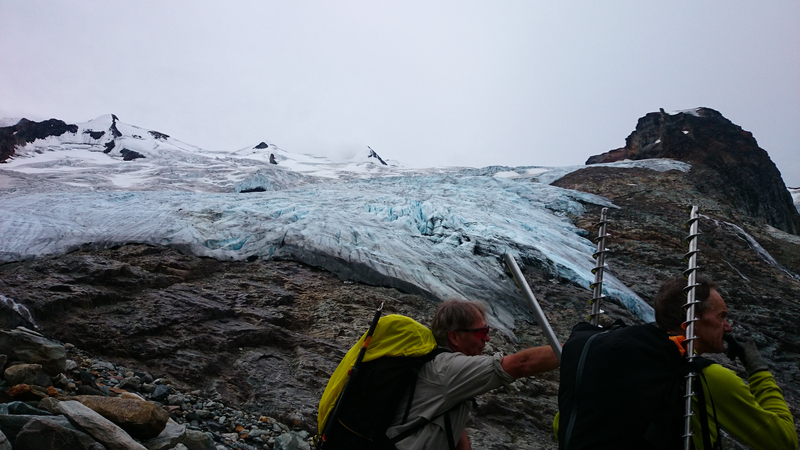 We spent most of the day installing stakes, and also a sensor in one of the streams emerging from the base of the glacier, to monitor temperature changes of the melt water. Rob, using an ice auger to drill a hole for an ablation stake. Depending on elevation and the expected amount of melt, holes were drilled between 3 and 7 meters deep. 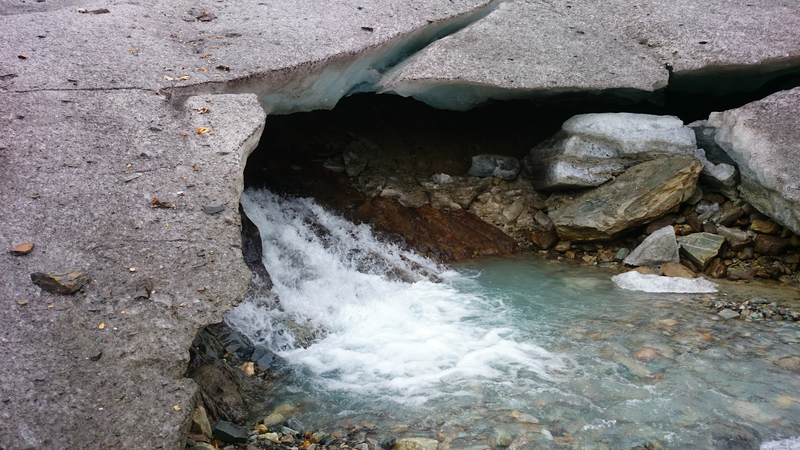 A temperature sensor was installed in this melt water stream, emerging from the base of the glacier. All about the angles. 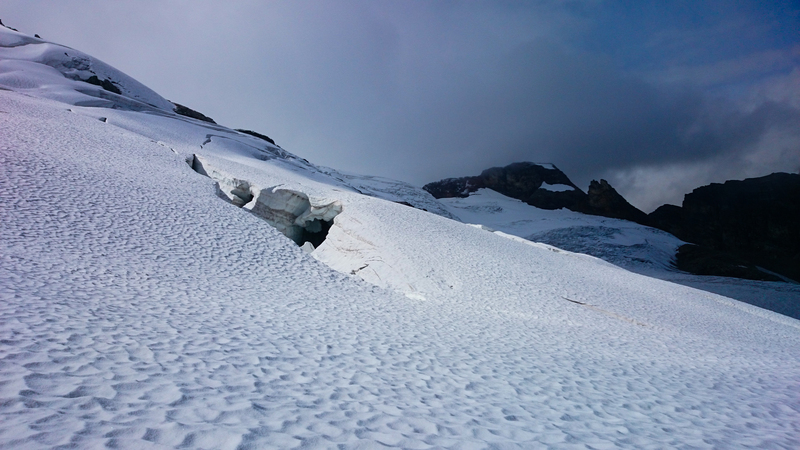 This huge crevasse and snow bridge were only visible when we came around the far side. During the winter, it is concealed by snow. 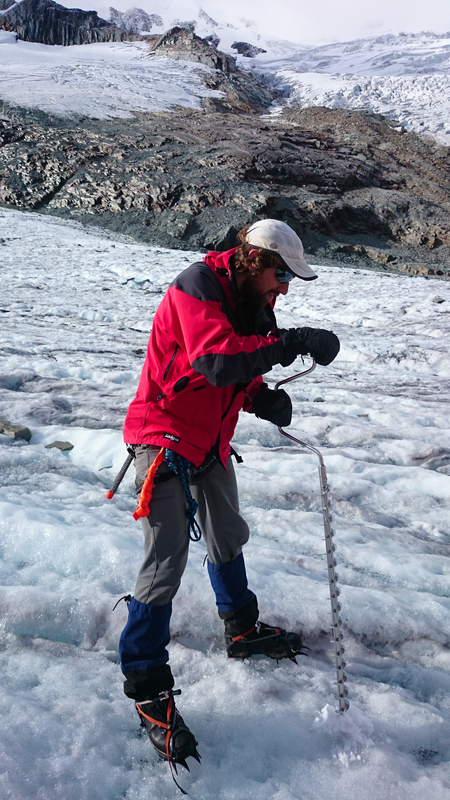 I had agreed to stay on after the work on Nordic, and to assist Ben and Bob with an ablation stake campaign on Conrad Glacier. I was also interested in assessing Conrad (also in the Selkirk mountains) as a potential location for installing a station next summer. Between flying down from Nordic and setting out for Conrad, we had a couple of enforced rest days. 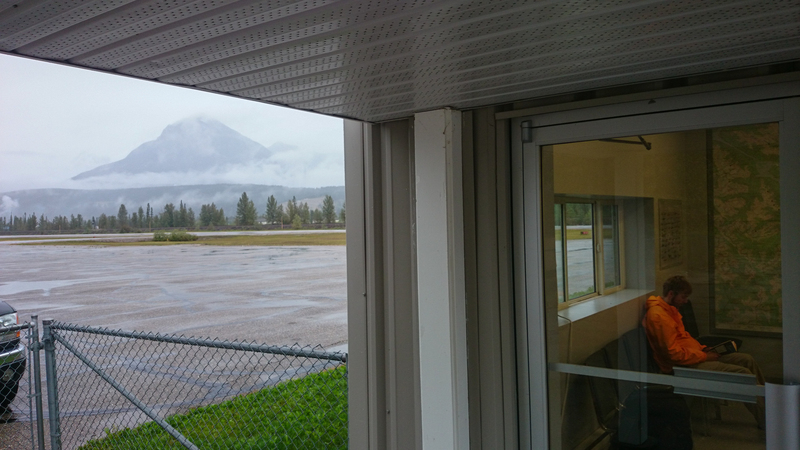 Low cloud meant that visibility was too poor for the helicopter, so we hung out in Golden, and Steve took us around some of the local mountain bike trails. Rain delayed. Waiting at the airport for a break in the weather. Cloud in the valleys was preventing us from taking a helicopter to Conrad glacier. A window of clear skies two days later gave us a few hours to fly to Conrad, and set up camp. The following are some images from our time there, and of the work we were involved in. 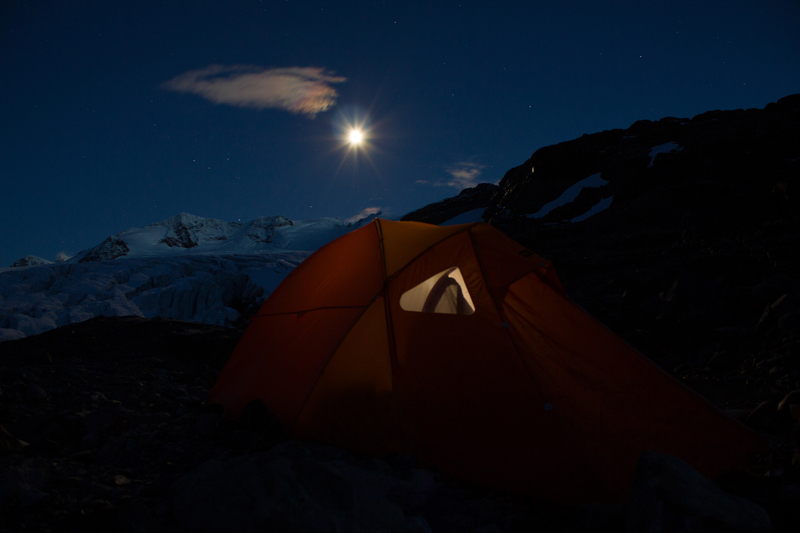 Conrad glacier, as seen from our camp. 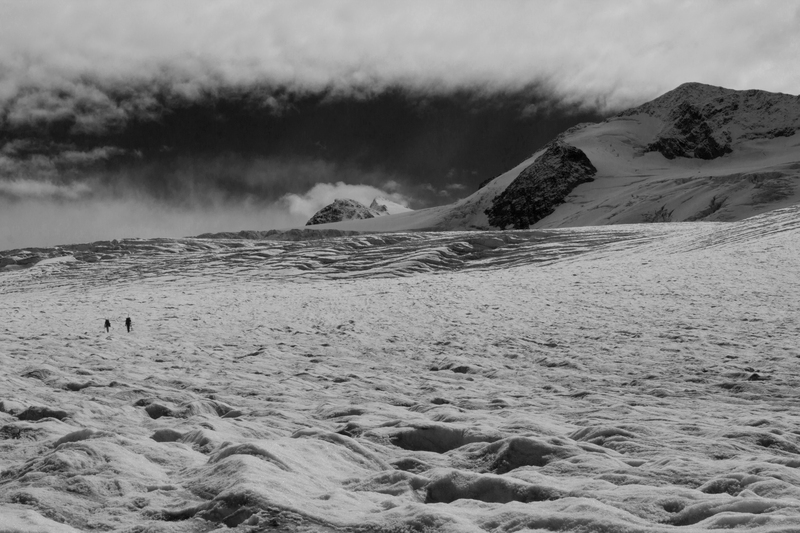 Although heavily crevassed along its margins, once this section was navigated, the main truck was relatively solid. Preparing dinner as the sun sets. 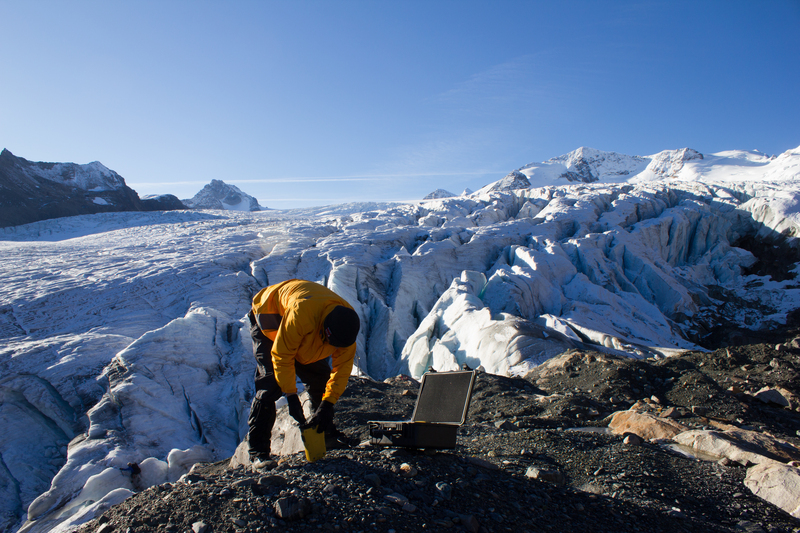 Ben, preparing the GPS locator, which would facilitate the airborne LiDAR scanner in producing a digital map of the glacier. 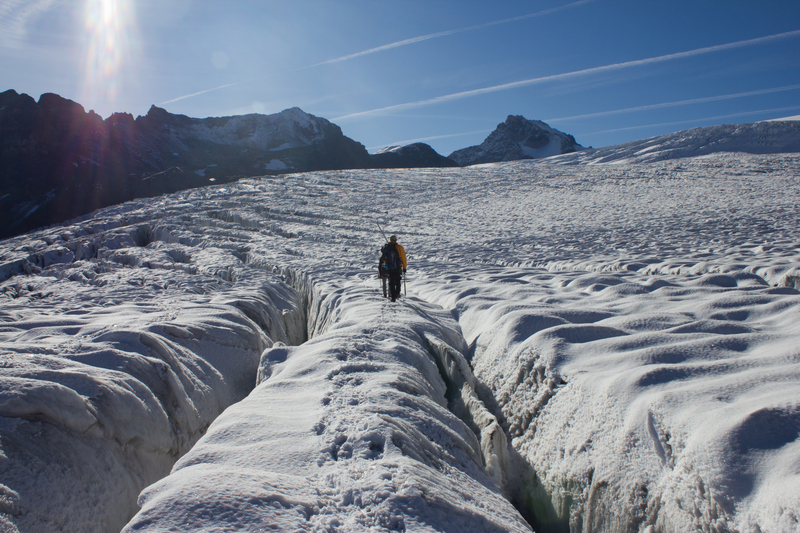 Gaining access onto the glacier. 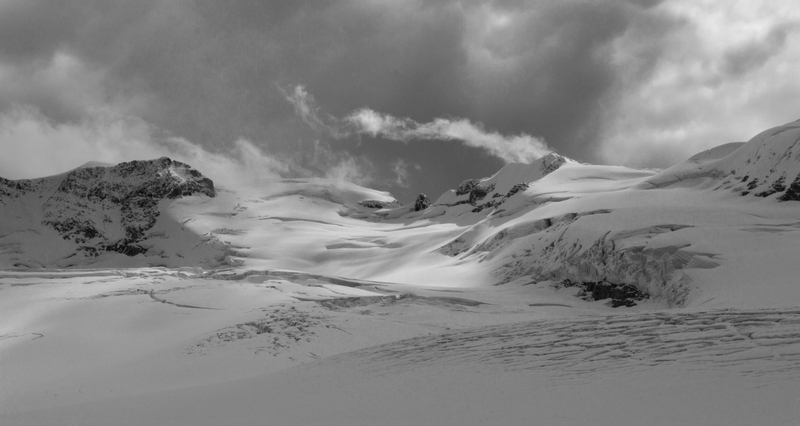 Navigating bands of lateral crevasses. Drilling boreholes into the ice, with depths of up to 6 meters, for installation of ablation stakes. On Conrad, we installed stakes every 100 meters or so of elevation. 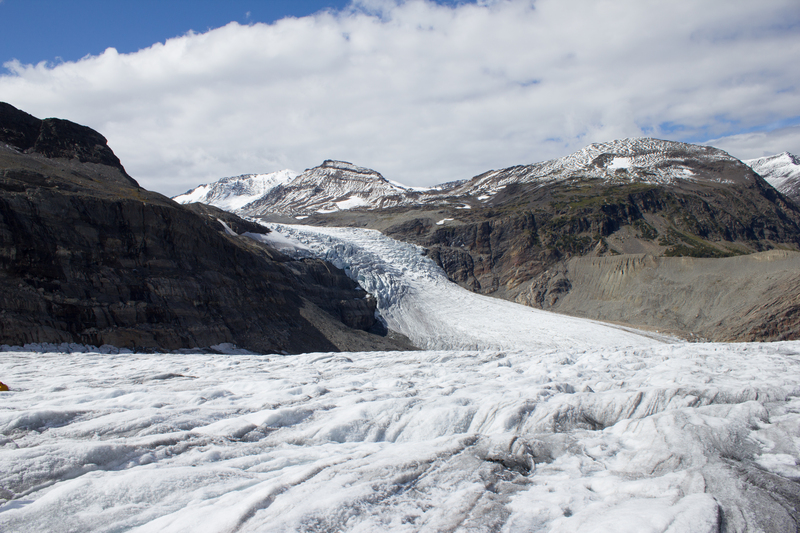 Ice falls of a tributary glacier. 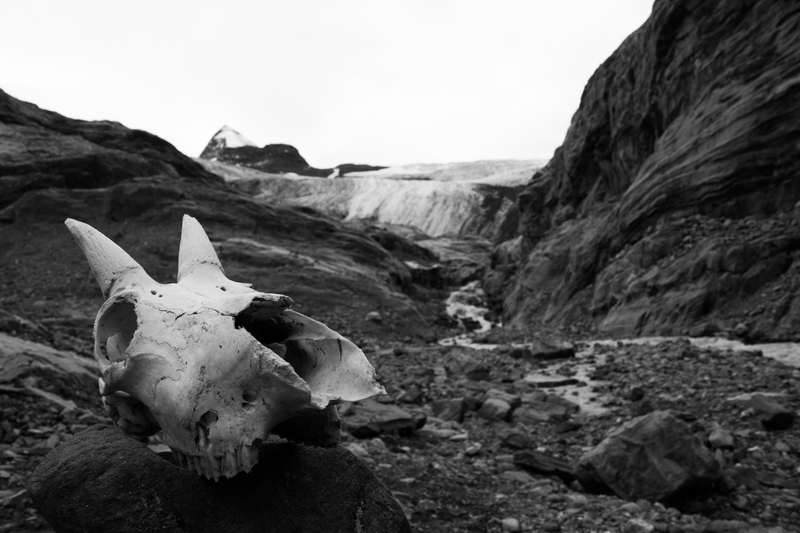 The skull of a mountain goat at the base of Conrad glacier. Returning back after a day on the ice, we found one of the tents flipped by the wind, and only moments away from being blown off the cliff on to the glacier below. Come to carry us home. 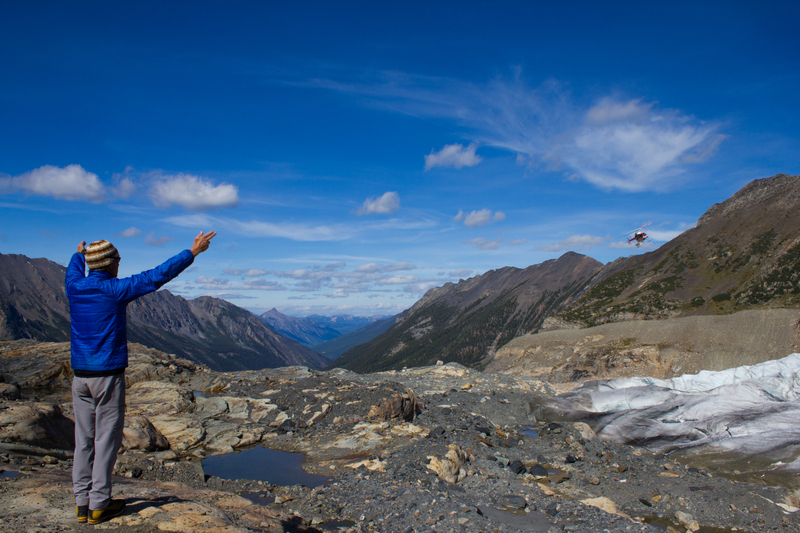 Bob signaling the location of the landing spot to the approaching pilot. I really enjoyed my time on Conrad. With my own project wrapped up on Nordic, I was better able to connect with the landscapes around me. 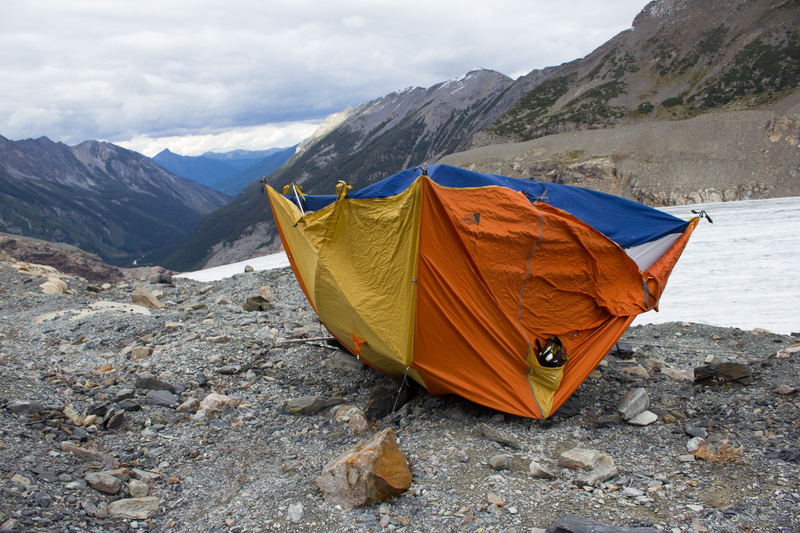 This was wilderness; rock, ice, water, and weather, with little to distract from it. With night temperatures below zero, and winds that spoke of snow, it was clear that the summer was ending, and it was a beautiful location to bid it farewell for this year. The last day was an epic. 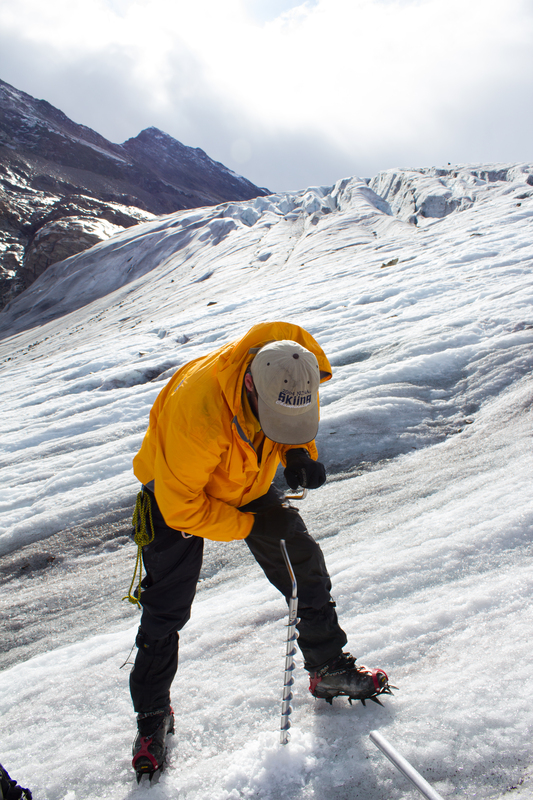 We rose at 6 to piercing blue skies, and spent the morning installing the remaining stakes higher up on the glacier. 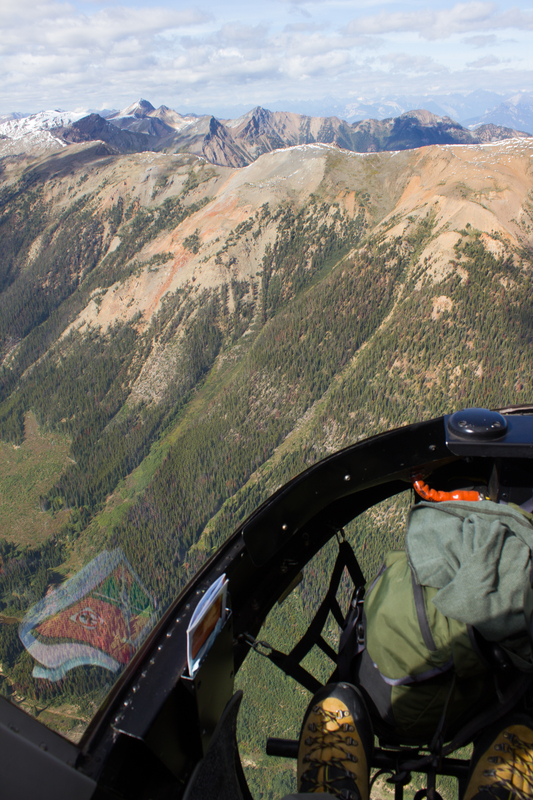 We returned to break up camp, and were picked up by helicopter at 3. It was 5:30 before I was pulling out of Golden, with the drive back to Vancouver ahead of me. Arriving at the University shortly after 3am, I unloaded the equipment as quickly as possible, and was thankful that my running in and out of the building with expensive equipment did not alert the suspicions of security. Night shift. 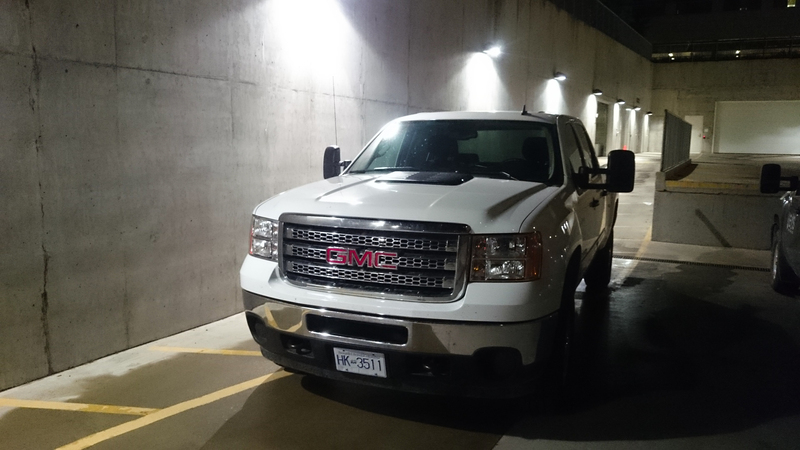 The truck, finally unloaded, after an epic day. The main purpose of the field work was to obtain data. So in some ways, the work is really only beginning, and will continue throughout the winter, in the office and the lab. This summer’s campaign was just the first of several before the research questions of my PhD can, hopefully, be answered. However, a PhD can be filled with lots of missteps and wrong turns, so it’s important to recognise and appreciate when things go well. A solid first step. One down.